Desire’s Magic Theatre is something special, and Purson are unquestionably rock’n’roll purebreds, true descendents of some of the genre’s cultural and artistic icons. A quick forensic examination of the title track alone shows up trace elements of legendary Sixties’ bands T Rex and Spirit, percolated through hot blooded seventies hard rock. It’s lazy, but so difficult to avoid obvious comparisons… beyond parodying the title of Hendrix’s seminal 1965 album, ‘Electric Landlady’ has much in common with Cream’s heavily syncopated rhythms and dense mix of blues and rock, and yet there’s almost as much here that could be referenced to contemporary crowd pleasers like Sparks or The Scissor Sisters… the number of influences Purson take in their stride is breathtaking. Vocalist Rosalie (Ipso Facto) Cunningham’s sweet mezzo soprano gives it mucho vibrato on ‘Sky Parade’, a song that switches into the modal folk style of Jefferson Airplane, as does seven minute closer, ‘Bitter Suite’, both adding a swirling mix of psychedelic rock, vividly recalling other Bay area bands like Quicksilver Messenger Service, Country Joe and The Fish, and other innovators who burned out before their time. 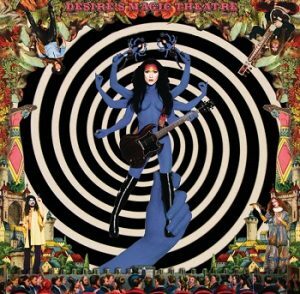 In fact, half the fun with this magnificent album is picking out the influences, and hearing just how Purson cut and shape them into their own likeness. 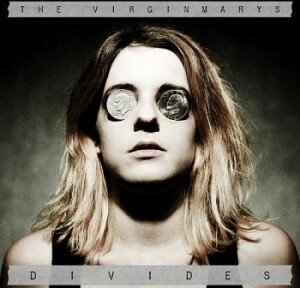 Divides is the The Virgin Mary‘s second “proper” studio album. Gil Norton follows Toby Jepson into the studio chair, no doubt to give the band more of an alt.rock sound. The album will attract immediate attention due to its fiercely sociopolitical lyrics. Full of razor sharp observations of life and living, the songs both underline a growing sense of outrage at the way in which society is unravelling, and cast light on painful, personal experience. Musically adept, the band fit those emotions to controlled blasts of rock and punk, sometimes both, occasionally laced with Sabbath strength riffs. Driven by a pulsing, primitive beat, the ominous opener, ‘Push The Pedal’ smells like the teen angst of post Nirvana alienation, evolved and expanded to make room for 21st Century challenges. The wonderfully titled ‘Halo In Her Silhouette’ satisfyingly digresses into the “adult punk” territory that was staked out and claimed by The Jam 40 years ago, with the same anti-establishment message. Elsewhere, the switch from the rhythmic propulsion of ‘Kill The Messenger’ to the sinister, ringing guitar clang and ragged vocals of ‘Into Dust’, (the album’s calling card) is, give or take, the band’s adopted template. 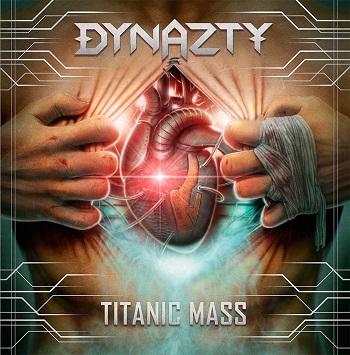 Titanic Mass is Dynazty‘s 5th album, and their second since a significant change in stylistic direction in 2014. It’s not an unfamiliar scenario. Many bands radically recalibrated in the in early nineties, resetting their sound to match the music coming out of the Pacific North West. Dynazty’s first three albums culminated in the stirring melodic rock of Sultans Of Sin in 2012. With Titanic Mass, as with 2014’s Renatus, the band display their born again Power Metal credentials, and while Renatus slipped and stumbled occasionally, this time they’ve really nailed it…securing their flamboyant colours to the mast with vigour and confidence. Still, old habits die hard, and a melodic rock undercurrent runs through the guitar’s rapidfire riffs and the keyboards’ dynamic rhythmic shifts. Borrowing a Progrock trick, they combine controlled vocal agility with an improvisational ethos, real or imagined. On the face of it, openers, ‘The Human Paradox’ and ‘Untamer Of Your Soul’ are slick yet spontaneous. But listen hard and you can hear Nils Molin’s vocal agility and Love Magnusson’s short bursts of spiky, tuneful axework constantly refreshing the page, confirming the chemistry that holds it all together. ‘Roar Of The Underdog’ and ‘Keys To The Paradise’, uplifting power metal anthems both, are compact, substantial tracks, they work so well because they have jettisoned the bloated baggage that usually comes with the genre. That uncommon quality and consistency runs right through the album. No wonder Spinefarm wanted to sign them. 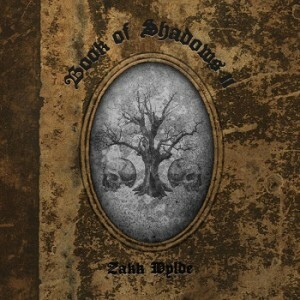 The unremittingly stark soundscapes of Black Label Society’s last album Catacombs of the Black Vatican are gone but not forgotten in Zakk Wylde‘s tardy follow up to 1996’s Book Of Shadows. Primarily acoustic, it is an album of insight and honesty, a pastoral album that only occasionally usurps its grace and flow with cranked up electric guitars. When it does, they soar, and are just as lyrical and as eloquent as any carefully crafted chorus. There’s a religious, The Band-like intensity to much of the material here, as Wylde’s born again humanity engages with his troubled past (Darkest Hour, Lost Prayer) carrying away any thoughts of self pity on the redemptive swell of Hammond organ. Bittersweet love song, ‘Sleeping Dogs’, and the confessional ‘Yesterday’s Tears’ pitch along on a soulful, emotional undertow – vividly recalling Neil Young – while ‘The Levee’ and ‘Harbors Of Pity’, two of the album’s standout tracks, go off tangentially, placing a nuanced emphasis on country music’s storytelling style. The sheer length and breadth of the melancholy in these grooves can be tough to negotiate over the album’s 73 minutes, and occasionally it feels a little indulgent. But there’s a certain exultation evident as you – and Wylde – emerge from the gloom and walk into the light.